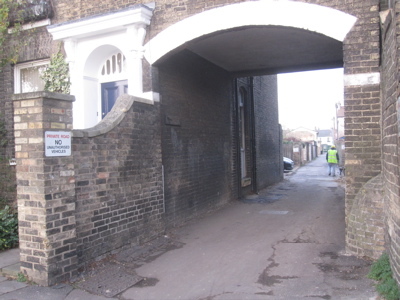 All elected representatives in West/Central Cambridge want a street-light under this archway, yet the county council refuse to fund the electricity. Four of of the six Liberal Democrats who are seeking to be the Lib Dem candidate for Cambridge in the forthcoming general election took part, as councillors, in the West / Central Area committee on the 10th of December 2009. The committee which comprised County Councillor Belinda Brooks-Gordon, and City Councillors Rod Cantrill, Julie Smith and Sian Reid, along with their fellow Market, Castle and Newnham councillors, discussed the installation of a new streetlight at “Mud Lane” in Cambridge. The light was being considered as an “Environmental Improvement” intended to light up the path / private road at its junction with Parkside. This item has apparently been on the West/Central committee’s agenda for years but despite all the councillors agreeing the new light ought be fitted, the committee putting City Council money up to buy and install the light, and City Council officers having obtained permission from the owners of the archway to attach the light to their property it was reported that the Conservative run County Council has refused to cooperate and blocked the proposal. The meeting was told that the County Council have said that as no ongoing revenue stream for funding the electricity to be used by the light can be identified it cannot be installed. None of the County Councillors present made any commitment to follow this lunacy up themselves. Cllr Rosenstiel was the only councillor who showed any serious frustration at the state of affairs. He questioned what the point of the City Council, and the area committee, is if it can’t do something as trivial as get a streetlight up when all the elected representatives for the area agree it ought be installed. Cllr Rosenstiel said he was “very disappointed we can’t get a simple streetlight”. Cllr Reid was much more muted in her comments, merely observing: “It is very odd that the County Council can’t fund the electric for one extra streetlight”. The estimated for the cost to the City Council of installing one the one extra street-light on Mud Lane has been given by council officers as £5,000; and that astonishingly high sum isn’t even a research grant style “full economic costing” taking into “overheads” such as council staff and resources. It appears that whenever public money is being spent on something costs become astronomical; I think we need elected representatives with a better grasp of the value of money. 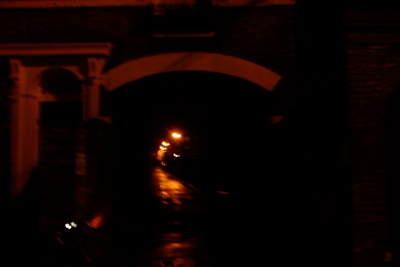 There are council streetlights along the length of Mud Lane, just not under the archway. Council officers recommended that the committee ought remove the light from the project list on the grounds that they had hit a brick wall with the County Council. Councillors disagreed and unanimously decided to keep going, instructing city council officers to continue work on trying to get the light installed. The same problem has occurred in the North of the City, where councillors, particularly Labour’s Mike Todd-Jones, would like to see seven new street lights on the St Albans Road Recreation Ground, near the Meadows community centre. Again the plans have been thwarted because: “revenue funding for the lighting upkeep needs to be identified prior to the scheme going ahead.” *. Councillors in the North Area even considered solar powered lighting paid for by the council’s “Climate Change Fund” to which the Liberal Democrats had allocated £250,000 in a symbolic gesture but had not spent. Street-lights are not the only area where the Conservative County Council anti-democratically frustrate attempts to improve Cambridge City; the worst examples are those were the County Council Cabinet step in and overrule decisions made by the Traffic Area Joint Committee. The degree of pettiness in the relationship between the county and city councils was also seen during another item at the West Central meeting when it was revealed the City Council had not even been made aware of the County’s plans to re-pave the area in-front of Cambridge guildhall; work which was completed a couple of weeks ago. I don’t think party politics adds anything to local government; these are all examples of what happens when we’ve got a Conservative County Council failing to work with a Liberal Democrat city. This entry was tagged Arbury, Julie Smith, Market Ward, Street Lighting on December 16, 2009 by Richard Taylor. You say “I don’t think party politics adds anything to local government”. Do you think the London Boroughs of Wandsworth or Hammersmith and Fulham would be so successful if they weren’t led by strong Conservative teams? Richard, I have had my differences with some aspects of County Council policy, but I do not think that they are being unreasonable in terms of requiring revenue funding for streetlamps etc to be identified. It seems astonishing that the City Council are not able to figure this out, and include a bid for revenue funding in their plans. It seems to me that the real problem here is that the environmental improvements team are just being given too much to do. I agree, councillors from both the City and County are at fault here. The very expensive area committee system which brings City and County councillors and officers together ought be able to sort out problems like this. If the county councillors present had taken the item up they may have been able to get the county to install the light. It seams crazy to me to have a system where some lights on a street are paid for by one council and some by another – with all the complexity and administration that goes into running such a tangled system. I agree, that is very poor that a committee of ruling Liberal Democrats, including three Executive Councillors, haven’t got enough of a grip on running the council for them to be able to sort out paying a sum of £17/year. Perhaps the owner of the dark passage could be made to instal a light on the grounds that it is a danger to the populace? With the current Liberal Democrat administration in Cambridge improving your own shop forecourt / private road or other privately owned but publicly visible or accessible area might not make economic sense as if you let it deteriorate the council won’t come along and make you improve it (as councils would elsewhere) but they’ll spend public money doing it up for you. I’ve argued at area committees for owners of property to be asked / encouraged / made to improve it themselves rather than councillors spending public money to do it for them. Point taken, Richard. Although I feel I ought to just pick you up on the point about the AJC too. It is not unknown for the (Lib Dem dominated) AJC to pass motions that the KNOW are against County policy and then jump up and down complaining about the County Council. A recent example is proposials for residents parking on Rathmore Rd / Hartington Grove. When a largish area was surveyed, residents opposed the scheme except on two roads. The AJC then voted to push forward a scheme on these two roads. The County, quite reasonably in my opinion, has a policy not to put resident parking in very limited areas because it tends to just shift the problem and so of course turned it down. I have no doubt this is party political pettiness on both sides; that’s why I’m questioning the value parties add to local government at all. If it were really a matter of “no ongoing revenue stream for funding the electricity to be used by the light” then the problem could be solved my the simple act of removing the lightbulb from one of the other streetlamps on Mud Lane. pathetic that they can’t sort this out – but astonishing the costs the public sector are quoted by private contractors! I’m sure they could advertise and an electrician could sort this out for 1/25th of the cost. This street light was raised again at the West Central area committee on the 21st of June; it is still on councillors’ environmental improvements list and there still has not been any progress towards resolving the question of who could pay for its running costs. Councillors asked their officers to write to the provider of the County Council’s new streetlight PFI project to investigate any options they might be able to offer. The obvious solution is for the City Council to get the light installed and to come to an agreement with one of the neighbouring houses to fund the ongoing electricity costs. That is if they really feel strongly about the streetlight, or is it mainly a political football with the County? There is an excrable extension of flats adjacent to the lane that astonishingly the council granted planning permission for in the not to distant past. I am sure it has an electricity supply. I believe that the Mud Lane arch itself is owned by Peterhouse.